A lovely Facebook post about me and the work I did for the documentary Zanzibari High (now called Curse of An Addict - Zanzibar). Post by Curse Of An Addict-Zanzibar. A new year has just started and all I would like to do is to wish you all a great 2014!! May it bring happiness, good health and great achievements to all of you! 2013 has been a good year for me. It has been relatively successful and I certainly will remember it. Projects like Zanzibari High and Relevo have represented in their own way important milestones. The same I can say for my music being used on La Repubblica's website! All has been great and yes, I feel I've achieved something in the past 365 days. Now let's only hope things keep on going the way they are going (and I'll do the rest)! Thank you all for your support in 2013 by the way! I'm really grateful for all you guys have done. Here's a visual summary of the biggest events that took place in 2013. The music used is my Sentieri d'Autunno. This is one of the best ways to say goodbye to the old year and welcome the new one, hoping that it will be better. I'm proud to announce that Relevo, an experimental short film that I had the pleasure to work on, is finally complete! 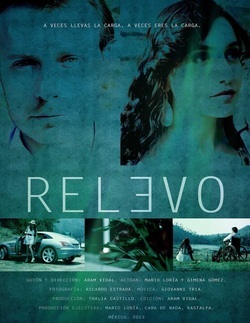 Relevo, which was written and produced by Aram Vidal, has been a wonderful adventure. "Short" yet intense! Relevo is a 9-minute film belonging to the drama and thriller genres that takes you into a journey about life and its cyclicity in particular. Aram is a also a very nice guy to work with; I've actually enjoyed collaborating with him very much. What has impressed me the most about Aram was the fact that he has made me feel at ease and confident since the very beginning of the Relevo Project. Aram never questioned my skills and one of the most common phrases he used was "I trust you". This has always made me "feel good", gave me great motivation and it actually pushed me to do well and try my best throughout the project. For Relevo I've written the music, the sound design and I've also dealt with the dubbing mix, therefore I had full responsibility of the sound department. Overall, I'm quite pleased with the results and so is Aram and the rest of the film crew (which is the most important thing for me). I've uploaded an excerpt from the film on the Music for Film & TV page, so feel free to have a look at it and say what you think! The Way To Her Heart is still paved with beauty and positivity! After nearly three months since La Repubblica started using my compositions in their fotoblog, my music is still being used in Il Mondo in un Minuto. Yesterday, once again, they chose me and the track that was picked was The Way To Her Heart, my first attempt to combine the classical and the metal genres in one composition. The section that has been utilised is the intro, which is mainly orchestral in the classical style. In my opinion the music goes really well with the images because it gives a nostalgic and melancholic feeling. You know, I am really glad about what is happening to me thanks to La Repubblica and the lovely people working on the fotoblog. My music and I are getting significant exposure in Italy, which is very important for me. Il Mondo in un Minuto is in fact quite popular and has an average of 25000 plays per post, even though it does reach more! This is just fantastic! The idea of knowing that all those people have listened to my music really makes me happy and it excites me very much! Hopefully this will carry on and luckily it will lead to something more, such as exciting independent projects and good collaborations with talented Italian artists! Today's "Il Mondo in Un Minuto"
Once again, my track The Pearl Earring; the Endlessness of a Moment has been used as the soundtrack for the top 10 pictures of the day!